We will wrap up our conversation on Nietzsche’s critique and how it might help us to examine our own expression of Christianity. You can read a summary of Nietzsche’s views on Christianity here and watch a short lecture on Nietzsche and Christianity below. 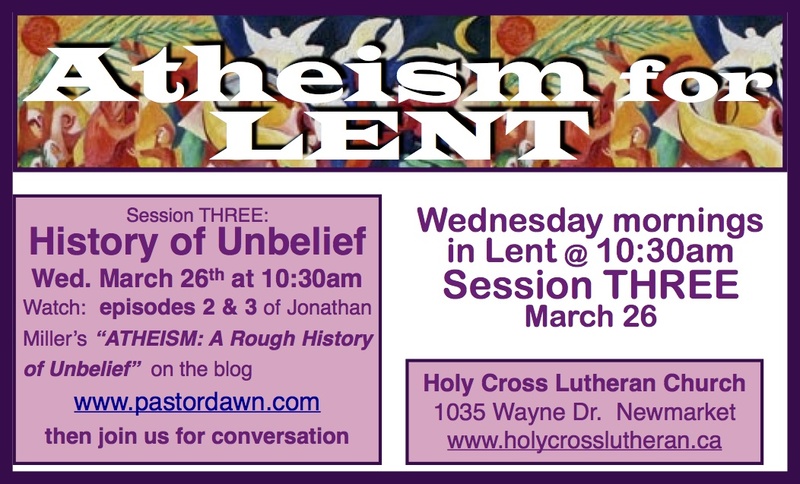 Please watch episodes 2 and 3 of Atheism: A Brief History of Unbelief (below) to prepare for our next class on Wed. March 23 so that we can begin to look at the critiques of Marx and Freud. This entry was posted in Adult Education, Evolutionary Christianity, HOLY CROSS LUTHERAN, Progressive Theology and tagged Atheism for Lent, emergent theology, emerging church, emerging connections, evolutionary christianity, Lenten Study, Nietzsche, progressive christianity, progressive theology, spirituality by Rev. Dawn Hutchings. Bookmark the permalink.